We manufacture all our cabinet boxes to ensure they meet our strict durability standards, and then partner with two innovative door suppliers to ensure you have a tremendous selection of door styles to choose from. 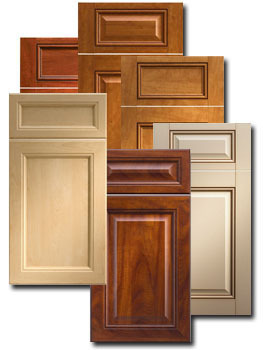 Decorative Specialties has been a leading cabinet door supplier for over 40 years, and their local plant in Monroe NC provides us with over 250 solid wood door styles to choose from in virtually any wood species. Northern Contours manufactures our stunning glazed thermofoil doors in their Corbin KY plant, offering a huge selection of beautiful thermofoil doors and fast turnaround. This partnership allows us to custom build for you a feature rich kitchen in any style you desire. White or wood grain cabinet interiors, glass doors, crown molding, light rails, pullouts, bump outs, bar backs, painted or stained, you name it, we make it. Our CAD/CAM design systems combined with CNC cutting/boring technology enable us to fabricate an average job in just 2 days, compared to 4-8 weeks for our competitor's "Factory" cabinet order. All at very competitive prices. 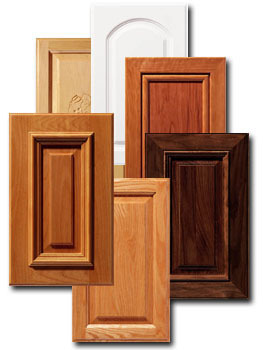 Click Here To View Our Selection Of Wood Doors. Click Here To View Our Selection Of Thermofoil Doors. Copyright © 2007 - 2019 Carolina Custom Cabinets and its Licensors. All Rights Reserved. Website Designed and Hosted by Effective Web LLC.